When it comes to hotels, the ‘Beige Age’ appears to be well and truly over, with boutique properties offering guests experiences they’ll remember (and talk about) for a lifetime. For a holiday you’ll never forget, skip the usual hotel chains and check into something a little out of the ordinary, recommends Dilvin Yasa. Ice hotels might tbe all the rage, but why sleep on a block of ice clad in a snowsuit, when you can drift off to sleep admiring the starry arctic sky from the comfort of an electrically heated igloo? 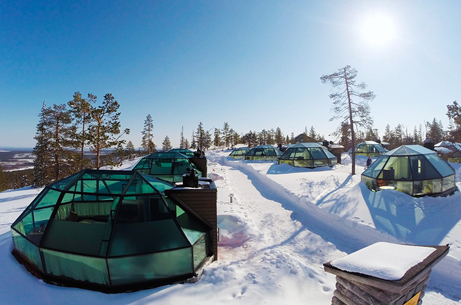 Located less than 10km from Finland’s resort town of Levi, the luxury igloos of Levin Iglut (leviniglut.net) each feature air-conditioning, non-fogging glass, a small kitchen and bathroom, Wi-Fi and motorised, comfy beds which can be adjusted for optimal aurora viewing. Open from the end of August until the end of April, guests can choose between the premium igloos built for couples, or the superior igloos which sleep two adults and two children comfortably. Those with high blood pressure may want to avoid this 4,505m2 hotel where nearly everything from the building itself to the furniture has been mortared using the only construction material available to them — good old fashioned salt from Salar de Uyuni, the world’s largest salt flat. Sitting in a salt-moulded armchair or sleeping on a salty bed may not sound like the most comfortable thing in the world, but rest assured comfort is key within the 30-room, climate-controlled property, with (seasoning-free) plush blankets and pillows provided. And the views of the salt flat expanse from each hotel room window? They’re nothing short of spectacular. Just pray it doesn’t rain. It’s not often you’re expected to climb in and out of your hotel room dressed in a safety harness and hard hat, but at Skylodge Adventure Suites (naturavive.com), it’s both a necessity and a pleasure. Clinging to a granite slope high above the Urabamba Valley (guests need to climb 400 metres of Via Ferrata to get to Skylodge), the ‘suites’ are essentially three aluminium and polycarbonate pods which are completely transparent, allowing guests to make the most of the sweeping, mountaintop view. Each pod features a rather primitive toilet and all meals are transported via the backpack you’ll be given before you set off for your pod. For everyone who’s ever wanted to camp without all that pesky nature stuff comes this unusual offering in the central Berlin district of Neuklln — a retro camping ground built within a former vacuum cleaner factory. Whether you’re up for a stay in a cosy caravan surrounded by potted plants, or you’d prefer a wooden cabin — complete with ‘outdoor’ picnic tables — Huttenpalast (huettenpalast.de) allows you to enjoy all the benefits of an outdoor lifestyle while remaining indoors. And should you feel you do need a bit of a breather, the space does have an actual garden dotted with hammocks, swings and dining tables. Found yourself a few bob short of booking a first class suite on a long-distance flight? You can still have that ‘sleep flat on a jumbo jet’ experience with an overnight stay at Jumbo Jet, a retired Pan Am jet located at Stockholm’s Arlanda Airport. Extensively renovated post-retirement, Jumbo Stay (jumbostay.com) features a multitude of accommodation options, from hostel-style dorm beds to a luxury suite in the converted cockpit, as well as a caf and bar. Best of all, staff are dressed like flight attendants to give you that authentic ‘up in the friendly skies’ feeling, for next to nix. For everyone who feels their lives have truly gone down the crapper comes an opportunity to stay — and reflect on whether this is really the case — in renovated sewage pipes on the banks of the river Danube. Continuing with the ‘tiny spaces’ trend made famous by the capsule hotels of Japan, Das Park Hotel (dasparkhotel.net) offers maximum comfort within a tiny space, with each pipe offering guests a double bed, storage, power and lights, blankets, sleeping bag and a ‘pay what you can afford’ system. Open from May through to October, the experience is so popular with those seeking a cheap bolthole that a second Das Park Hotel has opened in Bottrop-Ebel, Germany. When said in the correct tone, ‘swimming with the fishes’ can sound like a threat, but when it comes to travel speak — particularly when referring to this underwater hotel room located a short boat ride away from Vsters harbour in Lake Mlaren — it can be an experience to remember. The brainchild of local artist Mikael Genberg, guests at Hotell Utter Inn (visitvasteras.se) enter what appears to be a tiny Swedish cottage like any other, but then slip through a hatch door to descend three metres below the water’s surface into the watertight bedroom where said scaly friends await just outside. Open between April and October each year, Hotell Utter Inn has no electricity, but offers guests a portable gas heater, kitchen equipment and lighting.